Both Microsoft and Machinima claim the deal, which paid YouTubers to present the Xbox One in a positive light, was nothing unusual. Update: Machinima has issued a separate statement apologizing for how the deal went down, stating that it typically requires channel partners to include certain language in their video content relating to its promotions. "That didn't happen here and we're evaluating why," the statement said. "All participants are being asked today to include our standard language going-forward. We apologize for the error and any confusion." 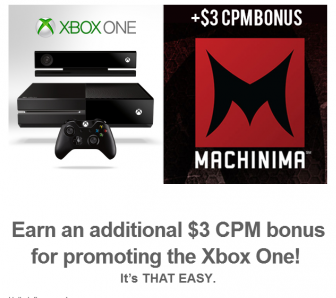 Original Story: Earlier in the week, Neogaf uncovered a rather sinister promotional deal between Microsoft and Machinima, in which Machinima would pay out a bonus to video makers who put the Xbox One in a positive light. Now, both Microsoft and Machinima have commented on the deal, saying that it was a 'typical marketing partnership,' and that these kinds of deals are common. The last part, about the confidentiality agreement, is particularly important, as it was previously assumed to mean that video producers were not allowed to say that they were being paid by Machinima to promote the Xbox One. Under the deal, video producers would receive an extra $3 per thousand views, as long as they made a video that used Xbox One footage, was at least 30 seconds long, mentioned the console by name, and did not present Machinima, Microsoft, or the Xbox One in a negative light. The program was capped at 1.25 million total views, so the maximum combined payout was $3,750.